For several years now I have watched a drama unfold. I have seen a man and his tiger be the target of animal rights extremists, with a gang type mob mentality. At the helm, a sanctuary, that did indeed start taking in donations for when they had the cat seized. They did that at the start of the fight. Cats are often sent there because this sanctuary is in fact in coherts with the Humane Society of the United States. Yes, I am referring to Tony the Truck Stop Tiger in Grosse Tete Louisiana. It is now beyond the point of simply “confused” or uneducated animal loving people… it is now the concentrated effort of domestic terrorist, whipping the public into a feeding frenzy. Fed by nothing but lies, the un educated public thinks this tiger “needs to be saved”. 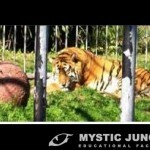 What they do not realize is that this tiger has it better than he would in the “sanctuary” that is pushing to get him. 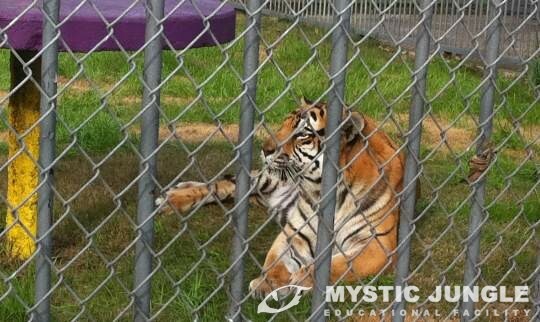 This “sanctuary” places the big cats in round cages. Why you may ask? Well, even if the cat starts to develop stereo typical behavior from the stress of being gawked at by people being fed sob story after sob story for donations, or not ever having contact or seeing their prior owner that they are bonded to, and they begin to pace, …. who can tell? The cat is forced to walk in a circle instead. Tony’s enclosure is HUGE. But activist will await until he is in his lockout while they clean the main enclosure area to take photos. They take shots of him laying on the top of his den, like he has no where else to go, or the empty pool during the time they drain the pool for cleaning. They claim that his life is in danger because he is next to a highway and the fuel pumps and has to inhale fuel fumes. Umm, the sanctuary that is trying to steal him is actually by a major road. So what is the difference in either place? One would charge (the “sanctuary”) to see Tony, while his true owner does not. The other place would put him in a round cage while his true owner has him in a safe secure huge ENCLOSURE. Oh.. wait.. I know. The sanctuary stands to gain a LOT of money from donations, then when he dies (and he will if they succeed and manage to have him sent there) he will be offered up to the public as being sponsored “In Loving Memory of” and Michael of course will “be the evil man” that did this all to him. Michael Sandlin is a far better person than I am. He has endured all these years of being a target. Death threats, harrassment, attacks on his personal life, and yet he has perservered. If this was all about his ego or the money, then I cannot fathom spending as much money as he has to keep Tony with him. Yet look at how much money the ALDF(Animal Legal Defense Fund) has spent trying to have him seized and sent to that sanctuary. How many animals could they have saved… after all.. that is what they are supposed to be doing right? Fighting for the ones that are abused, neglected, abandoned? Tony the Truck Stop Tiger is an American icon to every private owner or private facility out there. If they manage to convince Governor Jindal to veto the bill that legislation passed, allowing Tony to stay where he belongs, this will set the precedence that private property is up for grabs to the biggest bully with the most money. The animals life, nor the persons life mean nothing. No matter your preference in exotic animals, this should concern you. If a extreme person or group gets you in their sights, you are fair game, and stand to lose everything you own and have worked for. They stand to take away the living breathing beings that you most likely have bottle raised, slept with, prayed for in times of illness, and have stroked that fur or scale or feather and shared your deepest secrets with. There is a reason the animals are viewed as property. That is not as bad as it is being made up to be. Being property means that we have rights as American citizens, to KEEP our property. That is what this country was supposed to be all about. But there is hope. With the HSUS (Humane Society of the United States) having to ante up to Field Entertainment (Ringling Brothers Circus) for false accusations and years of coming after them in court.. maybe for once the good guys are winning.